For far too long we gave Kelly the benefit of the doubt. But his one-time proponents have now returned to our senses. Like much of the country, I breathed a sigh of relief last year when President Donald Trump, in perhaps his most consequential personnel shake-up to date, named retired four-star Marine general John Kelly as his chief of staff. I’d been an outspoken critic of the administration, but — while part of me appreciated that the chaos had nearly paralyzed the White House’s ability to advance its destructive agenda — I recognized that a White House in turmoil was good for the United States neither at home nor abroad. What’s more, I had a special attachment to the increasingly distant and quaint memory of a highly functional 1600 Pennsylvania Avenue, having served there for nearly three years during the Obama administration. So, I added my voice to the chorus of praise for Kelly. On Twitter, I called him a man of “honor and decency.” I echoed that sentiment on TV, adding that I welcomed the order I expected he’d instill in Trump’s freewheeling policy process, especially within the national security realm. I soon came to realize I was wrong on both fronts. Nothing highlights this better than Kelly’s initial defense of Rob Porter, the outgoing White House staff secretary accused of spousal abuse. Kelly’s statement had the veneer of dignity — condemning domestic abuse — but, at its core, it still defended and even endorsed the man accused of these vile acts. Unlike other commentators, however, I should’ve known better. I had the opportunity to interact with Kelly during my time at the White House, and I never found him to fit the mold of a team-oriented policy wrangler. What I’ve since come to realize, however, is that the initial collective embrace of Kelly was about something bigger than any one man — or any other senior administration official for that matter. At its core, this was about our need for a hero, however flawed, in an administration that had brought to the surface far too many villains. To be clear, Kelly, a nearly lifelong Marine, served his country bravely over the course of decades, and he and his family have endured the unique horror of losing a child in battle. We owe him and his family gratitude for his military record and the sense of service he passed on to his family. 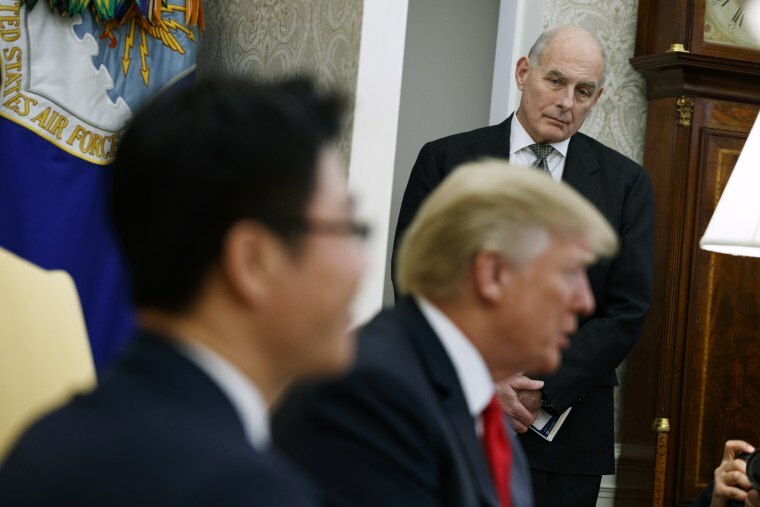 But I observed Kelly when he was head of the U.S. Military’s Southern Command, a role that required him to have one foot in the policy arena (where he now squarely resides), in addition to his military duties. Here’s what I knew about Kelly before I willfully forgot it: He’s a flamethrower who comes to the job with preconceived notions that rarely fit the reality. He was the military official who, at the height of the Ebola crisis in 2014, engaged in scare-mongering rhetoric about illegal immigrants potentially infecting Americans with the virus. He recounted during a press briefing of hearing of “five or six black guys” from Liberia, the epicenter of the outbreak, who were making their way to New York City by way of the Mexican border. This was about our need for a hero, however flawed, in an administration that had brought to the surface far too many villains. On broader policy matters under his purview — whether Guantanamo Bay, drug trafficking, or border security — Kelly tended to place his own policy views ahead of those of his commander-in-chief, whether in public remarks or long, winding email screeds he would often hurl at senior White House advisors. More parochially, he later launched a campaign to tarnish the reputation of one of my subordinates, a uniformed military officer who dared to challenge him on an issue of equity. Against this backdrop, I was as surprised as anyone to find myself celebrating Kelly’s promotion last July. I was far from alone. Among former White House colleagues, there was more than a bit of gallows humor at the irony of Kelly’s former antagonists now championing him, if quietly, as the last best hope to save our democracy. Then, unfortunately and for too long, we gave him the benefit of the doubt. Kelly couldn’t be blamed for the disastrous response to Charlottesville, we reasoned, because he was new to the job and, in any case, those were Trump’s extemporaneous remarks. Kelly, we hoped in vain, was signaling to the world his displeasure with the inclusion of “Little Rocket Man” in Trump’s United Nations address by burying his head in his hands. For too long, policy or personnel missteps were seen to have occurred in spite of Kelly, not because of him. That’s no longer the case, of course, and Kelly’s baseless — and perhaps worse — attacks against Congressman Fredericka Wilson in 2017 brought that into stark relief long before the indignities of more recent days. Nothing this week better illustrates what Kelly has become, however, than the statement he issued late Wednesday night about Porter. So why were so many of us willfully blind to the character of perhaps the second-most powerful figure in the White House? It was a function of Kelly’s years of service and sacrifice as well as the military honorific — “General” — by which those in the White House still refer to him. At the same time, however, Kelly represented something many of us hoped to see after months of national floundering and international embarrassment. He was a counterpoint to the foreign agents (Mike Flynn), nepotistic princelings (Jared and Ivanka), white nationalists and Nazi sympathizers (Steve Bannon and Sebastian Gorka), and bombastic blowhards (Sean Spicer and Anthony Scaramucci, among many others) who had taken over America’s most prestigious address. He was, for a time, our white knight and hero. But this fairy tale ends differently, of course, and many of Kelly’s one-time proponents have now returned to our senses. It turns out that we learned, once again, that Kelly is no hero. He’s certainly not the hero the American people need at this moment. Ultimately, however, he is what this White House deserves.